Those of us in flight test at California’s Edwards Air Force Base in 1959 accused the Lockheed F-104 Starfighter production engineers of turning the designer’s drawings upside down. The wings of most aircraft employed dihedral—they were set at a slightly upward angle—but the F-104’s wings angled in the opposite direction; the horizontal stabilizer and elevator sat atop the vertical stabilizer instead of below it; and the ejection seat fired down instead of up.We could recover from the spin that resulted from the aircraft pitching up uncontrollably when it stalled,which was due to the T-tail configuration, but most pilots who used the Stanley C-1 downward seat ejection system didn't’t live to complain about it. 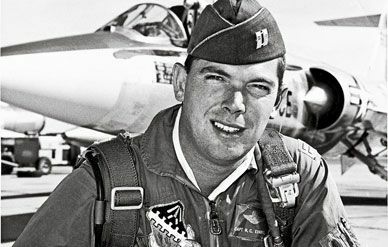 Twenty-one had died in downward ejection seat accidents, including, in 1958, X-2 and X-15 test pilot Ivan Kincheloe. The seat required the pilot to wear metal “spurs” on the heels of his flight boots, thus earning an F-104 pilot the nickname “Cowboy.” The spurs had slotted receptacles that the pilot slipped over steel balls at the base of the seat’s foot rest. The balls were anchored to cables on the seat that automatically pulled the pilot’s boots against the base of the seat so that when he ejected, he could safely clear the aircraft in one piece. I conducted my own investigation of these design decisions in late June 1959. I had just returned to the Mojave Desert from a couple of weeks leave on the East Coast and stopped by Test Operations to check on the status of the Republic F-105 that I was flying in a stability and control test program.My boss, Lieutenant Colonel C. E. “Bud” Anderson, asked if I would stand by for a safety chase flight he was scheduled to fly—it had been delayed all day and probably wouldn’t go. It was already 5:30 p.m., and the colonel had to meet visiting Royal Air Force test pilots at the golf club.As soon as he left, Flight Lieutenant Jack Woodman called: The flight was on.He was evaluating a Grumman F11F-1F as a fighter for the Royal Canadian Air Force. At 35,000 feet, 65 miles west of Edwards,Woodman and I had reached 1.87Mach when my engine developed excessive vibration.A glance at the instrument panel showed I was losing oil pressure—a recurring problem with the early J-79s. I immediately reduced power and turned back toward the base. I thought: This really can’t be happening to me! Knowing the procedure for placing the minimum balanced load on the engine compressor bearings, I had throttled back to 88 percent power. I was 15 miles from Edwards and at 15,000 feet and 450 mph when the pressure reached zero. I was too high to touch down safely on the 15,000-foot main runway, but the dry lake bed provided miles of overrun. Changing the throttle position would surely cause trouble, so I tapped the speed brake switch. Big mistake. The aircraft shuddered, the fire warning light came on, the engine ground to a stop, and the cockpit filled with smoke. In just a few seconds, I was able to see my altimeter as it unwound through 7,500 feet—ground elevation was 3,000 feet—and my airspeed drop to 275mph. I had to eject. Immediately. I reached down and pulled the D-ring on the front of the seat,which would fire the ejection cartridge. Nothing happened. I pulled again— still nothing. Looking down to make certain I had gripped it properly, I pulled a gain with all my might. I felt a tremendous blast of wind as I was fired toward the ground. I had been told that if you had time to think about the parachute deploying, that meant the lanyard that connected the seat to the parachute D-ring hadn’t worked. I looked at my lap to see if my seat belt had opened— it had.At the same time, I reached for my parachute D-ring and found it still in place on my chest strap. To manually activate deployment, I grabbed the D-ring and threw it far from my chest. The pilot chute streamed between the seat and my body, pulling the parachute out. The parachute canopy began to unfurl from my left side.Next came a tremendous shock on my shoulders as the chute deployed, snapping me around like a rag doll.Now I was plummeting head-first toward the desert. The next shock was in my groin as the chute fully deployed. The canopy was above my head—the most beautiful sight I’ve ever seen—even if the horizon was running directly through the middle of it, indicating that I was horizontal to the ground, which was fast approaching. Using all my remaining strength, I pulled the parachute’s top shroud lines and stopped my pendulum swing almost directly under the canopy. The ground was racing toward me, and before I could get turned around to face downwind, I hit the ground rotating. I landed in what had been Pancho Barnes’Happy Bottom Riding Club dump and was dragged for 40 yards on my back through broken glass and tin cans until my chute got hung up on a yucca tree.